It’s tough for a sports app to make a name for itself on the iPhone or iPod touch. The App Store offers a huge assortment of apps, varying greatly in quality, and covering every sport imaginable. To stand out, you need to have something that sets you apart. For Sports Illustrated, the venerable weekly magazine, the content does the trick. Good Sport: Sports Illustrated has meatier content than your typical sports app for the iPhone and iPod touch. But it also has prominent banner ads for other Time-built apps. 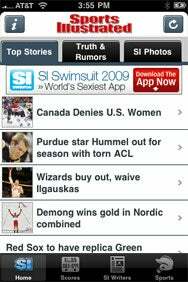 The free SI app from Time is broken into a few main sections: Home, Scores, SI Writers, and Sports. The Scores and Sports sections are fairly standard—live scoreboards in the Scores section, and news by individual sport in the Sports section. The amount of information depends on the sport. There is naturally more content available in the NBA section than, say, the Cycling section, which mostly pulls in top AP headlines. The strength of the SI app lies in the same area that gives the print magazine the reputation that it has always enjoyed: well-written original content and world-renowned photography. You’ll find that content under the Home and SI Writers sections, and it makes up the meat of the app. This is the sort of stuff you won’t find in other free sports apps that pull scores and headlines. Still, the Sports Illustrated app could improve in a few areas. While it’s hard to complain about ads in a free app, the banners promoting Time’s other apps can overwhelm you at times. (Are two of the same banners on the top and bottom of one box score necessary?) The overall navigation is, at times, not as smooth as I’d like. Sports Illustrated has the same app for the BlackBerry platform, and sometimes it can feel more like browsing a Web page than using a app designed specifically for the iPhone. These complaints aside, if you’re looking for more than a quick score update, Sports Illustrated has unique content that you won’t find anywhere else.